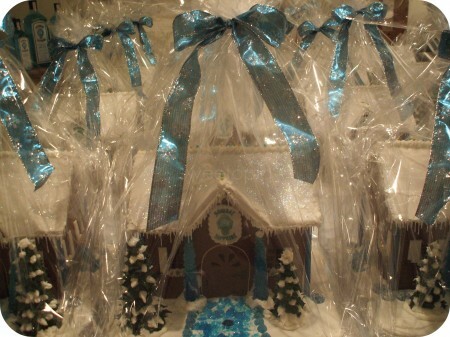 These are Bombay Sapphire Gin Gingerbread Houses. And how would you like 20 of them? 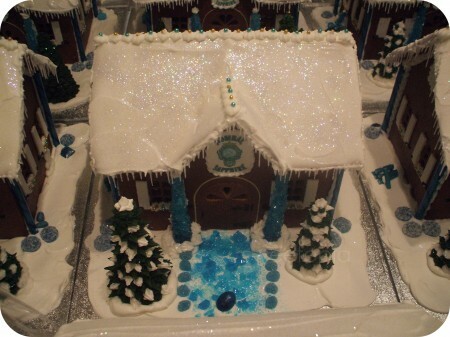 Each house has the ingredients for a Bombay Sapphire Gin Apple Cheer cocktail inside it. I don’t normally do orders, but I couldn’t resist the offer for the company which my brother’s girlfriend works for, Optimum PR, on behalf of their client, Bombay Sapphire Gin, last Christmas. This shot from above is dark but my old camera picked up the disco dust better in this shot. The blue candy ‘gem’ in the walkway is meant to mirror the gen in the Bombay Sapphire logo. Did you know that gin pairs well with desserts? Well, apparently it does. The Apple Cheer cocktail is evidently perfectly paired with butter tart squares. Mmmmm – that’s definitely on my ‘to try’ list this season. If you end up taste-testing before I do, I’d love to hear your feedback. These houses are unbelievable! And you did so many…I can’t even imagine how you completed this project. Wow! 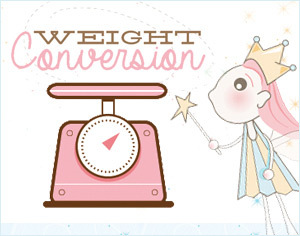 Beautiful job…love your talent and your blog! I can never bring myself to throw away old Bombay Sapphire bottles – the blue glass is so pretty! Love how you’ve used that blue in the columns and pathway. It’s stunning and so wintery! Wow, those are amazing! I love all the little details. Those are amazing!!!!!!! wow.. just so amazing! 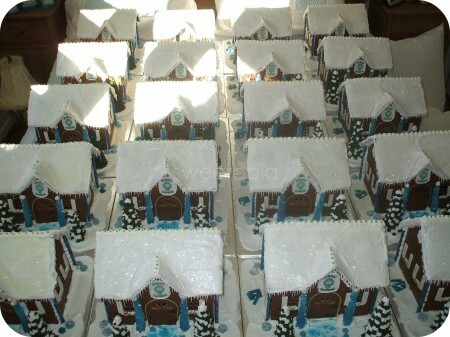 I was wondering how did you make those gingerbread houses, because they are fantastic. And I have always dreamed of making one, and these are so beautiful!! These are just gorgeous. It looks like the trees are a stiff buttercream icing? Did you use something to stabilize them, or are they just layers of icing? Absolutely beautiful…but of course you made them. Best butter tarts that I have ever tasted are from a little bakery in Huntsville called Ingoldsby’s. They freeze great and last a long time in the freezer. I am sure that they would go great with Apple Cheer Cider. Will definitely try it and let you know. These are stunning! I can’t even imagine how you did 20!!!!! – one would take me forever…..beautiful and elegant!! You’re truly gifted as a “candy artist”!! OMGOSH,Marian these are just Amazing !!!!!!! OMG Did you make these?????? they are most amazing. My kids would demolish the houses and I could take care of the gin! Well done Marian. These would make a great house warming present…… How big were they, just out of interest? and would you think of a tutorial in the future. WOW!!! These are so perfect and my goodness, the patience you must have! Just wonderful! Happy Holidays!! WOW! Those are amazing! It must have taken forever! Great job! Aren’t you the most clever “Baker” tee hee! talent’s and patience pays off… beautiful creative work. WOW! Those are awesome! I’m a fan of the Bombay Sapphire gin and that has to be the cutest thing I’ve EVER seen. Who did they give the houses to and did you have to build the houses around the drink ingredients?? Laura C, I only know one place for sure; the Toronto Star (newspaper), and two went accross Canada – one to Calgary and one to British Columbia somewhere. Other than that I think Bombay gave them to major venues around Toronto which serve their gin. Yes, I figured out how big the house would have to be to fit the ingredients and planned it around that. My husband had the bright idea of nailing small square dowels to the board, just on the inside of each wall, so that in case the apple juice, for example, rolled a bit during transportation, it would hi the dowel, not the gingerbread wall. These are really beautiful… a whole lot of work! @ Sam, @ Shelley: Thanks! Love these, the colours are so wintry yet pretty. Lucky customers, I wish I was on the receiving end. PS> I came here via Something Sweet, doesn’t that sound nice! I love theses! How did you make the “wood” door and the clear icicles? 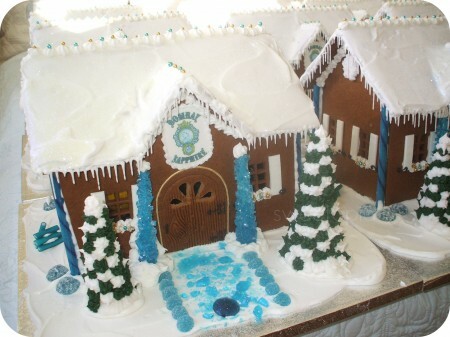 The wood door is just scored gingerbread. When the dough is unbaked, use a knife to score the door lines in. Make them fairly deep so they show up when baked, but not deep enough to cut all the way through.